We supply a range of quality chairs for hire which can also be supplied without a marquee. We also stock a range of chair covers for hire to complement your seating. Ideal for wedding receptions to corporate launches. 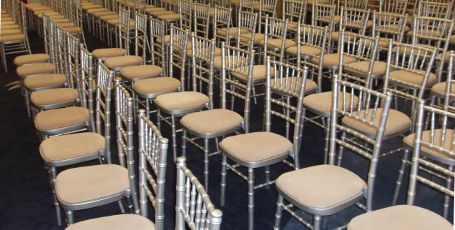 A contemporary silver coloured chair which includes ivory cushioned seat pads. Dimension: Height (89cm) Width (39cm) Depth (41cm). A classic wooden formal chair perfect for all types of events and celebrations. Available in silver and gold frames with cushioned seat pad. All of our formal seating range comes with standard coloured seat pads. However if you are looking to co-ordinate the colours of your theme or corporate brand, we have a selection of colours to choose from. Ideal for your indoor events and popular for conference use, these are upholstered using velvet fire resistant fabric and available in the following colours: Black, Blue, Beige and Burgundy. Check for availability with Your Quote Here. Lightweight waterproof garden seats which can be stacked. A polished lightweight aluminium chair that is ideal for outdoors, popular for café / bistro type events and marquee reception areas. Get your quote here to check for availability. Pearl Marquees stock a range of other products that will complement your chairs for hire such as chair sashes and chair bows. Boroughs: Solihull, Rutlands and Charnwood, etc. Cities in Midlands; Birmingham, Coventry and many more.